When it comes to dental emergencies, it is better to be safe than sorry. Hence, the first step to taking precautions regarding sudden dental injuries, such as toothaches or chipped teeth, is to have some contact information of dentists and dental clinics noted down. You never know when you might need a dentist, whether it is in the middle of the night or during an important occasion. Young children and senior citizens may also injure themselves in a moment’s carelessness. Emergency dentistry is an essential emergency service, due to the fact that they stay open round the clock to cater to your emergencies, which can be during the weekends, in the middle of the night or very early in the morning, when other clinics may be closed. When an emergency occurs, waiting till next morning is out of the question, as these issues need to be dealt with immediately. Also, those with a very tight work schedule who are only free on weekends, are the reason why there is such a dire need for emergency dental clinics. Hence, the wisest precaution in this case would be to keep some numbers written down in case of emergency. With a population of around 137,436 according to the 2010 census, Hampton, Virginia, is a hub for industrial establishments, retail and residential areas, historical sites, etc., for tourists and residents alike. Therefore, emergency services are in high demand, since clinics to cater to dental emergencies are absolutely essential in such a city. It is always wise to keep some contact numbers of dentists, although you could also opt for something as straightforward as calling 911. However, you never know when an accident might occur, therefore, one cannot remain cautious of dental emergencies. We have made a list for you with some numbers that might come in handy, just in case. Description Call to be connected with the perfect dentist for you. 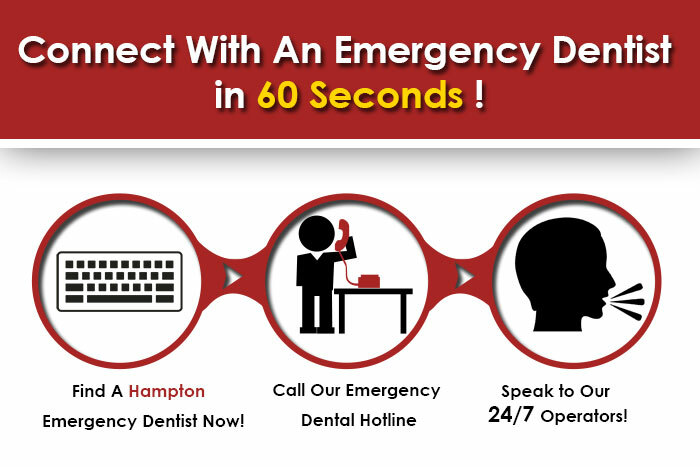 Hampton is a large city and we have the connections to find a dentist to fit your needs, and can get you an appointment immediately. Address:70 W Mercury Blvd #102, Hampton, VA 23669, EE. UU. Description: Situated at 70 W Mercury Blvd St. 102, this dental clinic is ready to cater to your emergencies. Stop fearing the dentist, as they assure rapid solutions to your problems with their relaxed dentistry. Call them to book an appointment today at 757-722-2929. Address: 2040 Coliseum Dr, Hampton, VA 23666, EE. UU. Address: 3834 Kecoughtan Rd, Hampton, VA 23669, EE. UU. Address: 2113 Hartford Rd c, Hampton, VA 23666, EE. UU. Searching for an emergency dentist in Beach, Virginia?